In 2017, pet owners in the US spent a whopping $69.5 billion dollars on pet, food, veterinary care, boarding and grooming! Us dog owners hear it all the time, “you’ve spent how much on a dog bed? !”, “how many toys does Fido need?!”. 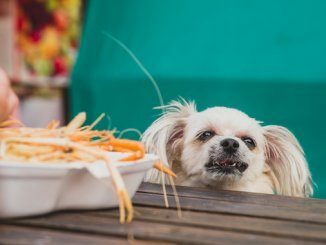 Why do we spend so much on our beloved dogs? The typical response is usually relating to how much we get back from our four legged friends so they absolutely deserve the best in life. But, are these pooches loyal because it makes sense in terms of survival, or, is there a scientific emotional aspect to this unfaltering loyalty? 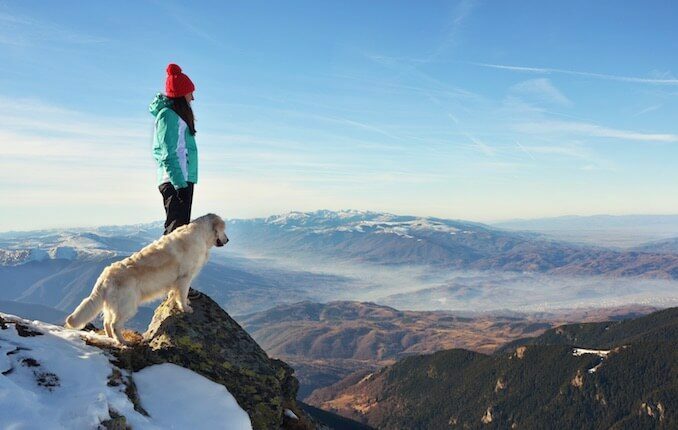 The question every dog owners asks at one point, why are dogs so loyal? To set the scene, lets go back to when the dog was first domesticated. There seems to be some disagreement on when the dog first diverged from the Grey Wolf. Some studies suggest as recent as 14,000-15,000 years ago; others suggest as far back as 135,000 years ago. It is argued that wolves would interbreed with dogs throughout history, hence the differing opinions. What is sure, is that dogs and gray wolves share a common ancestor. It is generally believed that the domestication of wolves to become our modern day dog occurred through mutual gain. Wolves would seek out food sources; realizing that human hunts were a good place to scavenge. It is still unclear why humans were so accepting – some argue for protection, some argue for companionship. What is clear is the development of the more accepting dog. Wolves, and subsequently dogs, who were more accepting of humans, accessed sources of food. This survival technique solidified their place in the gene pool. These accepting wolves/dogs would reproduce; raising accepting wolves/dogs. Humans would have also contributed to this – unaccepting wolves and dogs would likely have been killed. But how did we end up with a dog from a wolf? We have hundreds of dog breeds; all different shapes and sizes. A study carried out on foxes can help us somewhat understand how we have the modern day dog from wolf descent. In this study, they found that as foxes became domesticated, their hormone levels changed. Specifically their adrenal stress levels. The reduction in stress hormone levels was linked to changing coat color and piebaldness. Not only this, as they subsequently bred more docile and tame animals, they noticed other changes such as; floppy ears, curly tails and changes in skull shape and size. Suggesting that the behavioral and environmental changes affected their physical appearance. As time progressed, humans, despite not understanding the concept of selective breeding, would have promoted it. Humans would have killed a dog who attacked or bit someone, those dogs who worked well on the hunt would have been cared for – increasing their chances of reproductive success. Humans would have noticed those tendencies in puppies, suitable dogs would have been kept, fearful or aggressive dogs would not. The differing opinion on the timescale of the domesticated dog suggests two alternative theories. If we are to consider that the dog became domesticated some 135,000 years ago, it is suggested that dogs exploited a niche for humans to care for them. If we consider the more recent time line, it is argued that humans fueled the domestication to serve as guards or companions. Either way, what we do know, even modern day dogs share similar genes to the ancient wolf. For whatever reason, humans inadvertently developed a selective breeding program. They would feed and care for those sociable and accepting dogs. They would promote those traits which were beneficial to humans; only allowing those dogs who demonstrated them to breed. There is an argument of a specific gene (e.g. WBSCR17) in dogs responsible for friendliness. 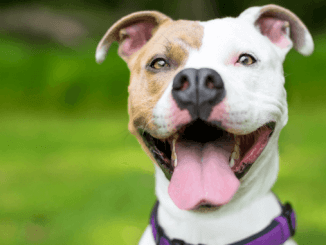 One study identified three particular genes, which in multiple variants or structures, or even missing, would contribute to how friendly the dog was. This does make complete sense in terms of domestication and selective breeding. So have we just selectively bred loyal dogs? There is no denying that dogs are dependent on humans. Studies have shown that if presented with an impossible task, dogs will attempt the task before quickly gazing at their owner, as if to ask for help. Cats on the other hand, will continue to attempt the task. We always say cats are the independent ones! So is it a fact that we have domesticated them that much, they need us? To feed them, shelter them and to help them solve problems? Potentially. But that doesn’t explain how they have developed such human like social skills and as us dog owners know, the illusion that they do actually care for us? 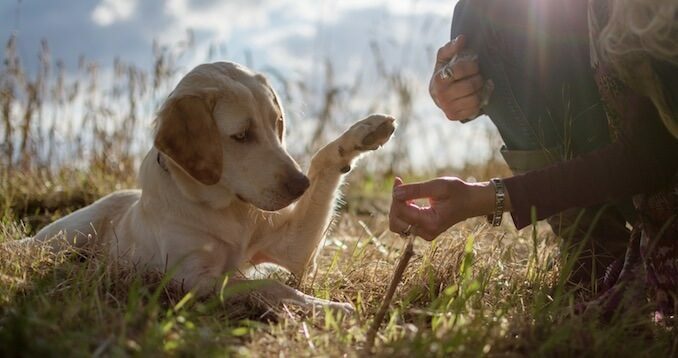 We know that dogs are incredible at reading human cues. Try it. 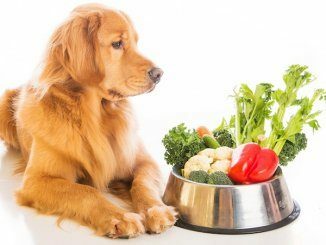 Fill an opaque container with food, then ask your dog where the food is. If you point to the container, dogs generally show impressive flare in solving this problem, based on your cue. Cats don’t. Dogs also demonstrate amazing empathy towards humans. Researchers explored how dogs would react to their owners being upset, along with complete strangers. What they found won’t surprise you. When their owner, or a complete stranger cried, the dog would show increased interest as opposed to them humming or talking. The dog would sniff, nuzzle and lick both owners and strangers alike. The dog would also present as calm and submissive. In order to be unbiased, it is necessary to mention a study carried out considering whether typical domestic dogs (not trained for emergency response) would seek help in the event of an emergency. In this study, owners would imitate a heart attack or fake being trapped under a book case. Throughout this study, no dog would seek help for their owner from a bystander. You could argue that they realized it was bogus or they were reading the lack of response from the human bystander. Either way, it does provide food for thought as we know so many dogs have been successfully trained in search and rescue capacities, seeing dogs, hearing dogs, assistance dogs for epilepsy – the list goes on. Dogs are trained to protect and serve. 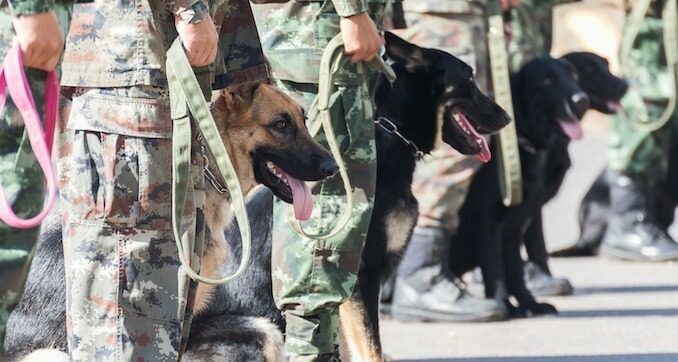 We have a long standing history of dogs being used in the military and law enforcement. An interesting lesson learned after the Vietnam war was that dogs were much more effective after spending significant time with their handler – dogs assigned to new handlers and then deployed were much less efficient in the field. This suggests that social bonding does impact dogs too. A study considered oxytocin levels in dogs, and their owners, during interaction; petting, talking and stroking. 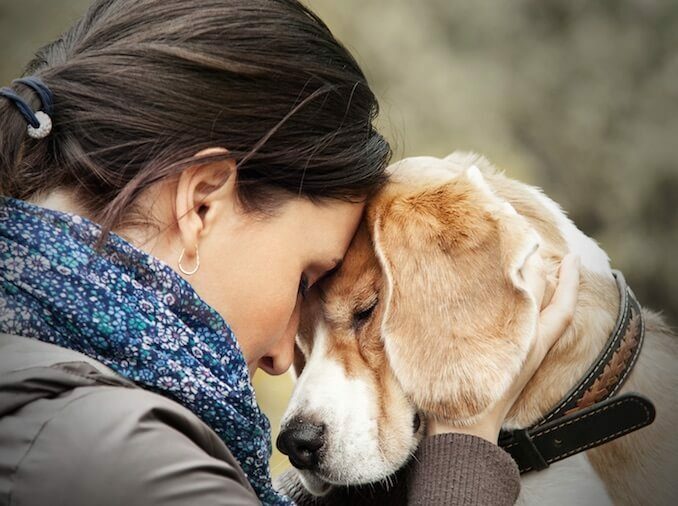 It was concluded that during interaction, oxytocin levels of both dogs and owners increased. Oxytocin is a hormone which plays a huge part in social bonding. We know that oxytocin is released during pleasurable social experiences like hugging or just receiving a touch from someone you love. For humans this is a vital need. Maslow suggested as human beings, we have a hierarchy of needs. Love and belonging is essential to humans in order for them to reach their full potential. It would appear that we achieve some of this sense of love and belonging from our beloved pooch! Dogs release that same hormone Oxytocin; suggesting they have the same feel good response to us that we have to them! Another study also found that when dogs sniffed their owner’s scent, their caudate nucleus activated, as opposed to sniffing unfamiliar scents. The importance of this sits with the function of the caudate nucleus and its association with positive expectations and rewards. In short, the dogs recognized their owners scent and had a positive association towards it. But how does all of this science and study show their loyalty towards humans? There is then the argument that dogs are pack animals – so obviously they will feel happier when with their pack – it’s just how they are. Pack theory suggests that historically, wolves and dogs would have lived in a complex social structure – a pack. The scientific explanation of pack theory is a historical and complex social structure where there would be an alpha male and female – the head of the pack. The lowest ranking animal would be named the omega. The alphas would have complete control over the pack – disseminating resources and food as they saw fit. Behavior would dictate position in the pack – through dominance and submission and ultimately illness. If the alpha became weak or ill, they would be challenged and replaced. 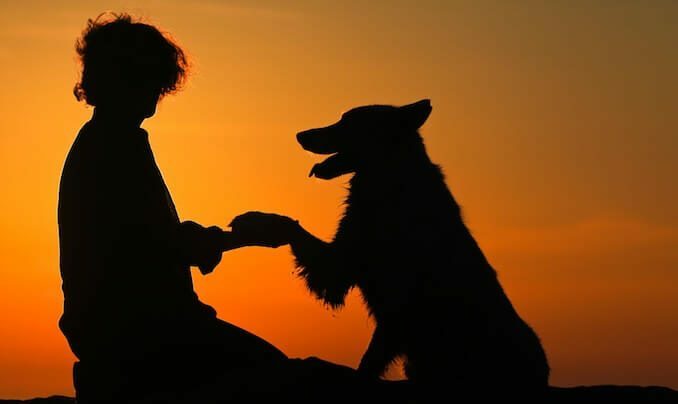 This theory originated through the study of captive wolves in the 1960s and because we know dogs diverged from wolves, it made sense they would behave in the same way. For years, dog trainers encouraged owners to be the alpha and to gain complete control over their pet dog. What actually happened in this study on captive wolves is completely irrelevant to dog and wolf behavior. 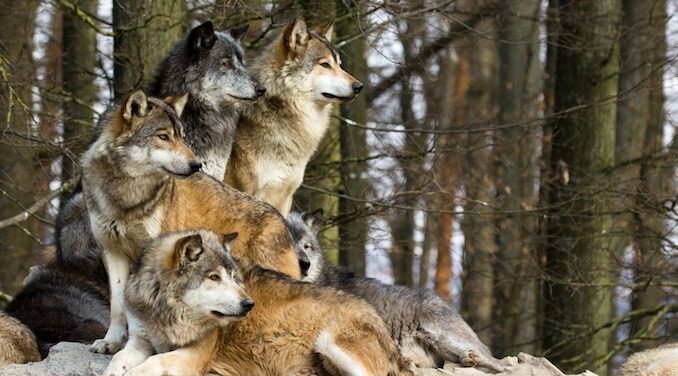 The wolves involved in this study were all from different origins and had been forced to live together. You only have to watch an episode of Big Brother to see why this was such a bad idea! 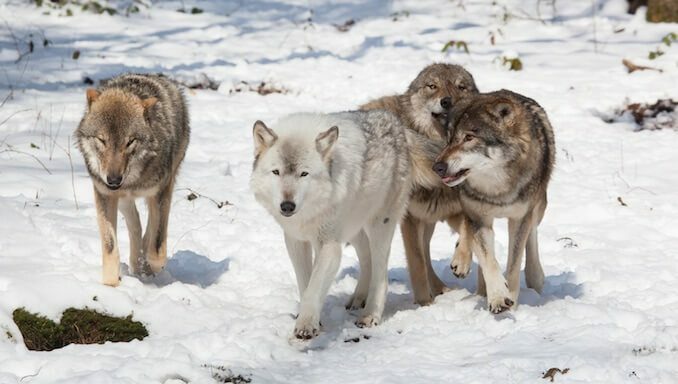 This author of this study, L David Mech, later refuted his original claims and instead described the wolf pack as behaving like a typical family unit – with parents and offspring. Once the offspring were old enough, they would leave and create their own family. These family units were based on cooperation and cohesion, conflict was extremely rare. 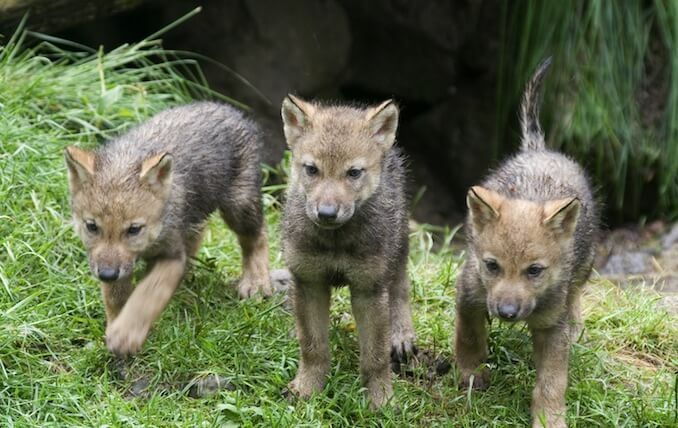 Canis lupus – Wolf Puppies demonstrating pack behvaior. We know that dogs and wolves are nearly identical at a DNA sequence – we know dogs came from wolves. We also know that through domestication; hormone levels and gene expressions have changed, impacting on behavior and appearance. We have to consider how relevant it is to compare wolf behavior to that of the domestic dog. A study comparing the development of wolf and malamute (i.e. an ancient working dog) puppies makes some pretty interesting points. The wolf puppies hit developmental milestones a lot sooner than malamute puppies. They could move quicker and climb higher. The malamutes struggled to escape their pen and were much slower when allowed into the woods to play. The wolf puppies were much more dependent on their wolf mother, yet the malamute puppies became aloof with her, reserving their greeting frenzy for humans. This study highlighted the wolf’s want to distance themselves from humans, whereas the malamute puppies actively sought out human interaction. The slower dog development also raises an interesting point; does the slower puppy development mean they are more reliant on humans for longer – therefore further developing the dog-human bond? The malamute coat and appearance was also different to the wolf puppies – the malamutes were more fluffy. We know that humans are hardwired to to respond to all things cute; it’s why babies have big eyes, chubby cheeks and button noses. There are suggestions that dogs have been selectively bred to appear more cute, to gain a response from our brain regions responsible for emotion and pleasure – triggering an empathic and compassionate response. It would appear that dogs have become dependent on us, we provide food, shelter, exercise and stimulation. They are more likely to seek a response from a human when attempting to solve a difficult problem, as opposed to the independent feline. Dogs are incredible at reading human behaving – responding to cues and also being empathic when humans are upset. Far from the original wolf, domestication resulted in behavioral and physical changes. Humans inadvertently selectively bred those more tame, docile and sociable – also more useful and efficient on the hunt. We have bred dogs for working and companionship. Those cute puppies ensure we are responsive to their needs – we are hardwired to do so! Both humans and dogs release the same hormone in each others company – the hormone responsible for social bonding and pleasure. For humans this contributes to our sense of love and belonging. We can only postulate that this also happens for dogs. Especially when we consider the positive expectation dogs have when they sniff their owner’s scent. Over the many years we have domesticated the dog, it appears we have developed a mutually beneficial relationship. Even the science says we’re happy in each others presence!